With immediate effect all NASC Health & Safety and Technical guidance titles, other than pocket guides and the TG20 suite of publications, will be available to download free of charge from the NASC website. The National Access and Scaffolding Confederation publishes a comprehensive and expanding range of industry guidance titles, all of which are regularly reviewed and updated by its Health & Safety and Technical committees. Copies of these titles have always been available to purchase in hard copy format from the NASC website www.nasc.org.uk. Until now free downloads have been restricted to NASC member companies only, with one notable exception. In 2015, and by agreement with HSE, the confederation issued the latest version of its iconic management guidance titled SG4:15 Preventing Falls in Scaffolding Operations. This 60-page A4 management guide has been freely available to download from the NASC website ever since publication. In the foreword of SG4:15 the then HSE Chief Inspector of Construction, Peter Baker commented: “It is encouraging that the NASC continues to fulfil their commitment as a trade organisation to develop guidance for their industry. 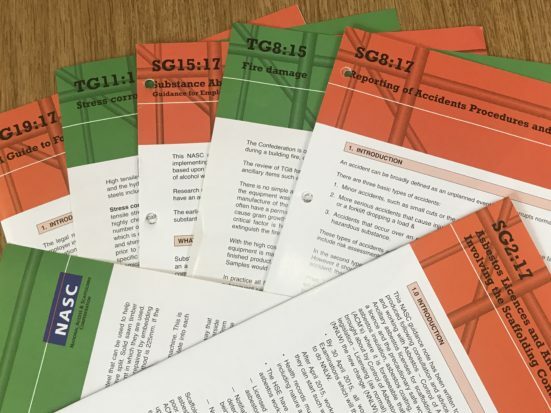 The confederation has now taken this a step further and made all of its Health & Safety and Technical guidance titles freely available to the scaffolding industry, other than the pocket guides and the TG20 suite of publications. NASC President Alan Lilley commented: “By continuing to refine and develop new and existing guidance titles the NASC recognises its responsibility to raise industry standards, not just for its membership, but for the scaffolding industry and the construction sector as a whole. For details on the new membership application process, copies of the NASC’s TG20:13, SG4:15 and the plethora of other recently published, industry-accepted Technical Guidance (TG) and Health and Safety Guidance (SG) and on the NASC – the national trade body for access and scaffolding in the UK – including how to become an NASC member, please visit www.nasc.org.uk or email: enquiries@nasc.org.uk.